Paige's Page: The BunkHouse- Decorating on a Budget. Remember this place? The very first place you can keep all yer loot you pick up from your battles? Well today, I'm going to teach you how to decorate on a budget. You already have the main items; hammock, table ,stool, light, rug and a pirate flag. Well lets go check out the bazaar and see what we can get for less than 1000 gold to complete this bunk house. So what do I need? 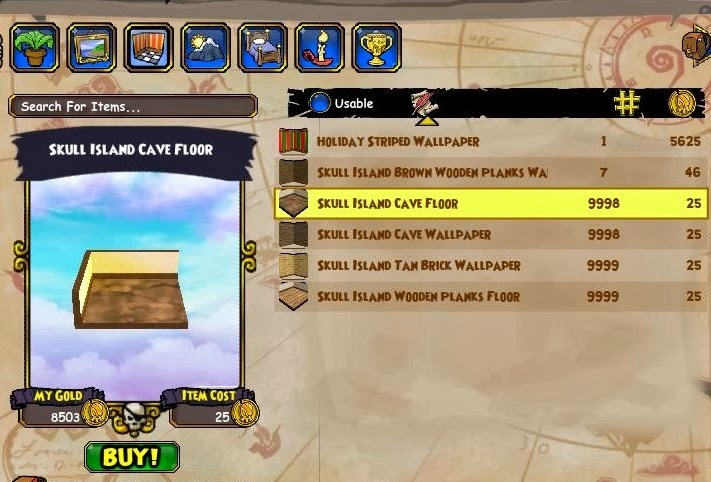 Wall paper and flooring, Oh look ,Skull Island Cave floor and either tan brick or cave walls? Lets go cave. Both at 25 gold each makes 50. Remember we are not going over 1000 gold. Next up furniture, we already have the basics but lets add some special items. If you click the amount tab you will find all those fantastic lowest prized items. Remember we got cave walls and floor so let's go with that cave feeling, How about a tent for 225, this would bring our total to 275. Now to add a couple plants at 50 each. Every Pirate needs weapons grab a few of those at 50 each. Now up to 525. I even got some misc food items for 10-20 each rounding my total at 605 gold. 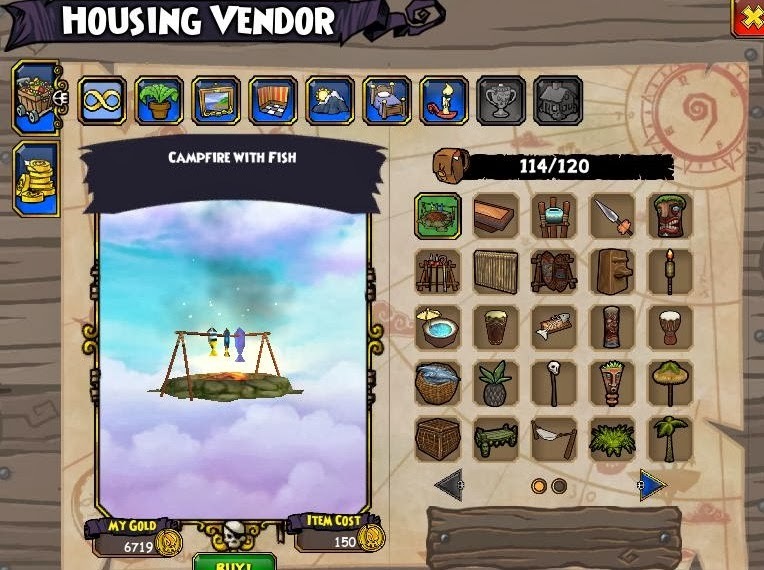 I'm really hoping for a campfire to finish off the 1000, Hunting the first few skull island shops might help with that. Rapa Nui for 150 gold was a steal! Misc other items to round off 915 total,. Oh and let's not forget out free drops like the loot pile. Let's decorate! See I have my basic cave scene. Not bad for under 1000 gold. So many things can be done with a Bunk house from little basic rooms, loot warehouses to fancy rooms. Here are a few other posts I did for Bunk house decorating. 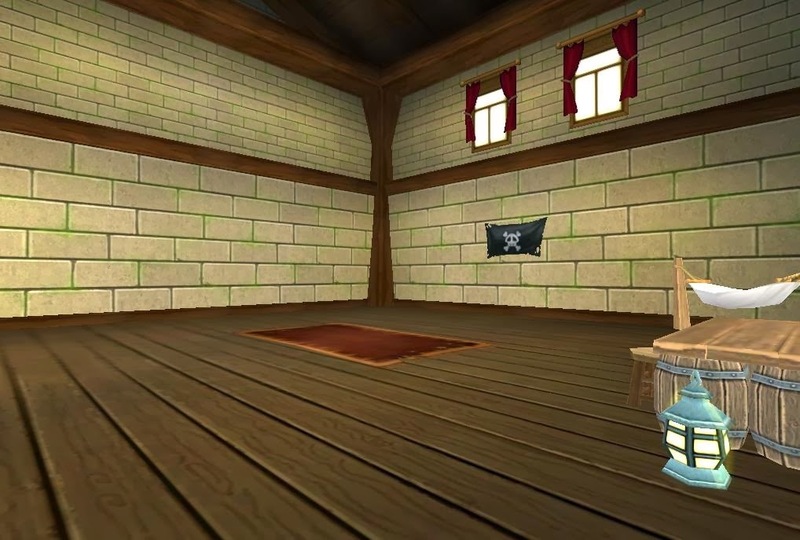 Let's Talk Pirate101 Furniture , Bunk House Decorating Pt 2 and Advanced Bunk House Decorating. Hope everyone enjoyed this segment. See ya in the skyways!